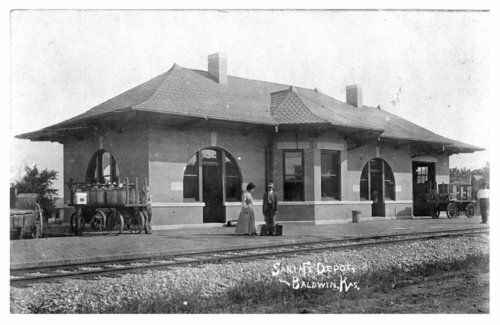 This photograph shows two people in front of the Atchison, Topeka and Santa Fe Railway Company depot in Baldwin, Kansas. In the background two men are standing on opposite ends of the depot. Built in 1907, the one-story brick building features a hip roof, arched windows, a freight room and two waiting rooms. The depot still stands and has been added to the National Register of Historic Places.